This review first appeared in the December 2009 issue of hi-end hifi magazine High Fidelity of Poland. You can also read this review of the Hansen Audio Prince v2 in its original Polish version. We publish its English translation in a mutual syndication arrangement with publisher Wojciech Pacula. As is customary for our own reviews, the writer's signature at review's end shows an e-mail address should you have questions or wish to send feedback. All images contained in this review are the property of High Fidelity or Hansen Audio - Ed. I never had a chance to listen to Canadian Hansen Audio speakers in as comfortable an environment as my home. I’d of course seen the adverts in Stereophile, read reviews in Enjoythemusic, The Abso!ute Sound and Stereophile but had no personal experience. When I learned of an opportunity to review the Prince v2, the middle model in the company’s line, I was more excited than I’d been in a long time. Hansen Audio founded by Lars Hansen is not yet another balloon of hot air waiting to bust. 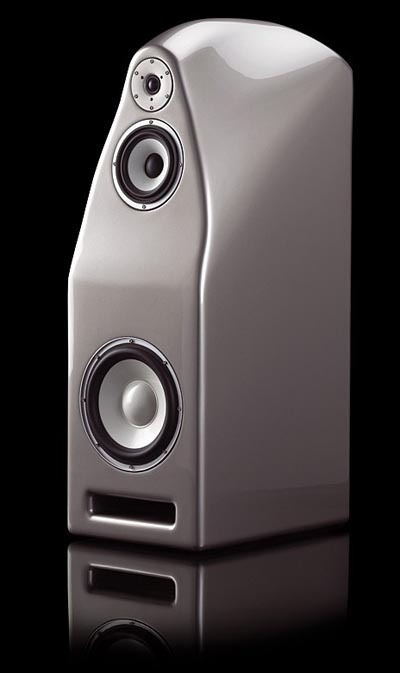 This is a true company with a real designer and these are outstanding loudspeakers. Founded in 2003, the firm is still young but already respected and recognized. We should begin this discussion with their enclosures whose three-layer sandwich is time consuming and difficult to assemble. The first layer is made from specially prepared epoxy resin with added glass fibers. The second is Rohacell, a very light spongy materials and ideal filler for multi-layer structures. The third layer is another resin with different fillers than the first. The fourth layer is the damping material which lines the inside cabinet. All this follows Lars Hansen’s belief that a loudspeaker cabinet is not an instrument but the foundation for transducers and thus must be as rigid and well damped as possible. This is also why each speaker weighs 85kg! In a special wooden transport crate, this mass increases to a mighty 120kg which the Polish distributor delivered to my flat. A first kudos for endurance! Neither are the drivers premium though off-the-shelf solutions. The 182mm midrange and 269mm woofer were developed and manufactured by Hansen Audio. Their diaphragms are made from layered and woven glass fiber and the woofer adds a vibration-cancelling damping material. The soft dome tweeter with its large suspension ring and metal front looks conventional and is made to specs by Scan-Speak. If I am not mistaken, the drivers are affixed to the cabinet with a special sealant or gasket to rigidify the connection. The woofer is mounted far closer to the floor than in my Harpia Acoustics Dobermann. Below it sits the bass reflex slot. I called upon the Dobermanns on purpose. Those are my reference speakers. I know them inside out and learned to appreciate them completely. I had not encountered any other loudspeakers yet which bested them in my home unambiguously and in all regards. But there’s more. Size, dimensions and approach of construction are further similarities between the Canadian and Polish companies which I’ll quickly summarize. First off, a loudspeaker needs to be sufficiently large to reproduce the full frequency range. Hence the Prince is a three-way speaker in a big enclosure. Second, the drivers must be time-aligned. Harpia achieves this by sloping their baffle and placing the tweeter in a special metal pod. 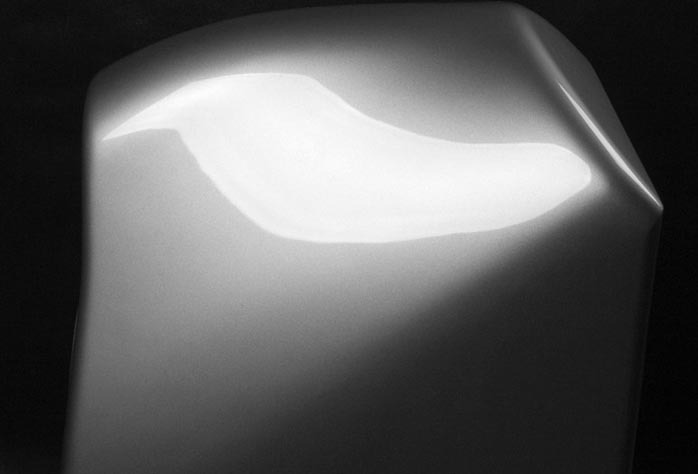 Hansen sculpts their baffle with a natural curvature that’s created during the lay-up. The Prince v2 is the only instance I know of other than the Dobermann where the tweeter, while set back via the midrange driver and woofer, is still placed vertically. Usually time alignment implies a sloping front or partial baffle to which the drivers attach in an angle. I think that’s wrong and Hansen concurs visibly. Another shared item is the crossover topology. Both companies agree on 1st-order networks (6dB/octave). Hence I will call upon the Harpia as my primary reference many times during this review. The Canadian speakers were positioned in exactly the same spot as the Poles but aimed almost straight ahead with only a small inward hint. The Harpias cross their axes in front of me. Ahead of the speakers I ran my Luxman M-800A power amp or an Accuphase P-7100 with the Ayon Polaris II preamp. Sources were Ancient Audio’s Lektor Prime and the DP-700 Accuphase, with cabling by Acrolink and Tara Labs. The electronics were placed on the Base rack. Analogue was compliments of a Linn LP12 + Ittok + Koetsu Urushi Blue combo. Music used for the review: Depeche Mode, Sounds Of The Universe, Mute, STUMM300, 2 x 180g LP; Ariel Ramirez, Misa Criolla, José Carreras, Philips/Lasting Impression Music, LIM K2HD 040, K2HD; Chris Connor, Chris Connor Sings The George Gershwin Almanac of Songs, Atlantic/Universal Music Japan, WPCR-25164/5, 2 x CD; Clifford Brown and Max Roach, Study In Brown, EmArcy/Universal Music Japan, UCJU-9072, 180 g LP; Duran Duran, Rio, EMI Electrola, 064-64 782, LP; Falla, El Amor Brujo, Frühbeck De Burgos, Decca/Lasting Impression Music, LIM K2HD 023, K2HD; Frank Sinatra, Nice’N’Easy, Capitol/Mobile Fidelity, UDCD 790, gold-CD; Frank Sinatra, Only The Lonely, Capitol/Mobile Fidelity, UDCD 792, gold-CD; Kraftwerk, Minimum-Maximum, EMI, 334 996 2, 2 x SACD/CD; Lars Danielsson & Leszek Możdżer, Pasodoble, ACT Music+Vision, ACT 9458-2, CD; Miles Davis, All Star Sextet/Quintet, Prestige Records/Universal Music Japan, UCCO-9294, SHM-CD; Miles Davis, Miles Davis And The Modern Jazz Giants, Prestige/Analogue Productions, 7150, 2 x 45 rpm 180g LP; Patricia Barber, Companion, Premonition/Mobile Fidelity, UDSACD 2023, SACD/CD; Paul Desmon & Gerry Mulligan, Two Of A Mind, RCA/BMG Japan, K2 CD; Pearl Jam, Ten, Epic/Legacy, 97413021, 2 x 180g LP; Rammstein, Stripped, Motor, 044 141-2, SP CD; Richard Strauss, Also Sprach Zarathustra, Zubin Mehta, Decca/Lasting Impression Music, LIM K2HD 035, K2HD; Sonny Rollins, Saxophone Colossus, Prestige Records/JVC, VICJ-60158, XRCD; Sonny Rollins, Way Out West, Contemporary Records/JVC, VICJ-60088, XRCD; The Modern Jazz Quartet, Pyramid, Atlantic/Warner Music Japan, WPCR-25125, CD; Tool, 10,000 days, Sony BMG, 681 991 2, CCD; Tsuyoshi Yamamoto Trio, Blues For Tee, Three Blind Mice, TBM-XR-0041, XRCD2.